I'm trying to re-create my Grandads Navy uniform, he escaped the dutch occupation via France, ended up having the choice of being in the French foreign legion or being handed over to the Germans then managed to get back to England to serve in the Dutch Navy! He served on the motor torpedo boat 229, my question is......would he have worn the same uniform as a British sailor but with different badges relating to his Dutch origin? Hi Nick, interesting question, unfortunately I can't help you in this instance other than to say that I would imagine he would have worn the uniform of the Royal Navy ( never seen any insignia relating to Dutch service in the RN) but I'm interested to know the answer also!, welcome to the forum by the way! Hi. I can't answer your question directly, as it's not something I know about. But I do love a research challenge! Excellent, thankyou for the links. I will have a look throughand see what I can find. When I get time I will type out my Grandad's story and post it on here. A Royal Navy uniform and Netherlands shoulder titles and a RNN cap badge for an officer. Not sure about a rating though. Personel of the Royal Dutch Navy used to wear the Dutch pre-war model uniform. 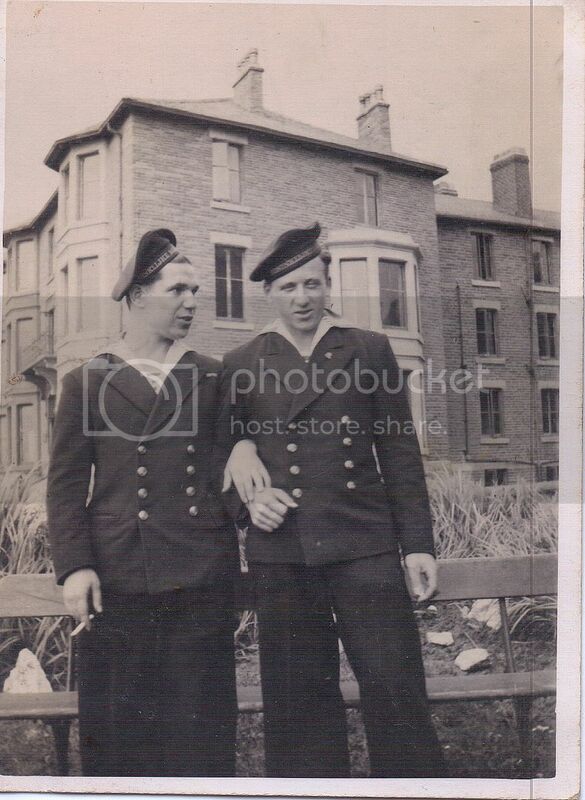 Due to wear, damage and exhasuted stocks it's not unlikely that some parts of the British uniform were worn during the war (like faul weather cloting etc) but always with the Dutch rank and tradebadges which are different than those of the Royal Navy. There was a straight tab with the text Royal Neth. Navy which was worn on the left upper sleeve. This was definately used in the Royal Dutch Naval Air Service (RAF 320 Squadron) but I haven't seen any photographic evidence of fleetpersonel yet. Ratings wore the Dutch navycap with captally KONINKLYKE MARINE or KONINKLIJKE MARINE. The Dutch navy uniforms were virtually nearly unchanged as late the 1960's except for the used materials. A good website for pictures is: www.maritiemdigitaal.nl Use the word MTB in the search engine and you will find a lot of pictures of the Dutch MTB Squadrons and its personel. If you need some help on your impression or anything else please send a pm. I know it has been a while since I posted in this thread but I have been doing some research using the links posted and they have proved to be most interesting! A strange thing happened last week, I went to my parents house and my mum pulled out an old photo album of my Grandmother's that she had found and guess what was in it......! He is on the right in the first picture. Any idea where these were taken? The middle one where my Grandad is with all the ladies has names written on the back of the picture and 'St Chads' - July 1944. A quick search shows a St Chads college in Durham but I'm not sure that is where they are. It appears that the first picture is in the same location also. 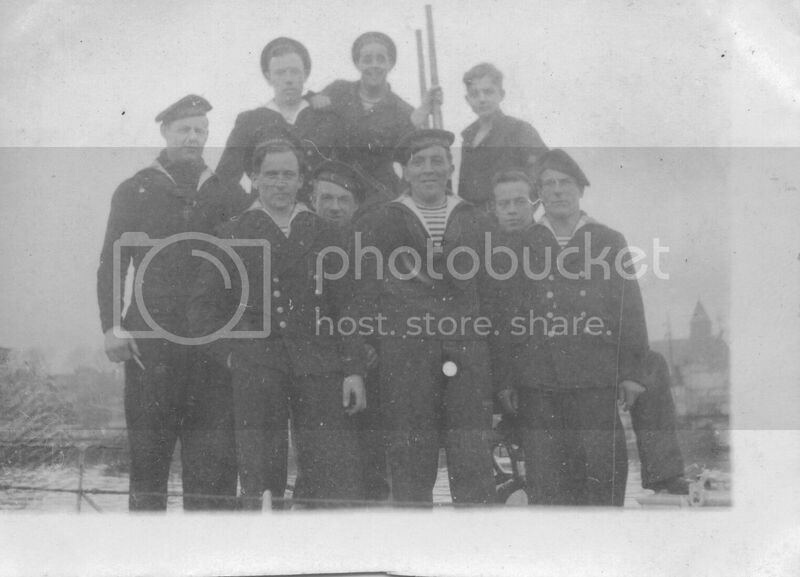 The crew picture is probably Dover as that is where he was stationed on MTB-229 although after D-Day he was transferred to a minesweeper in Harwich if I remember correctly so it could have been there I suppose. I will put some effort in to typing the full story up and posting it here. 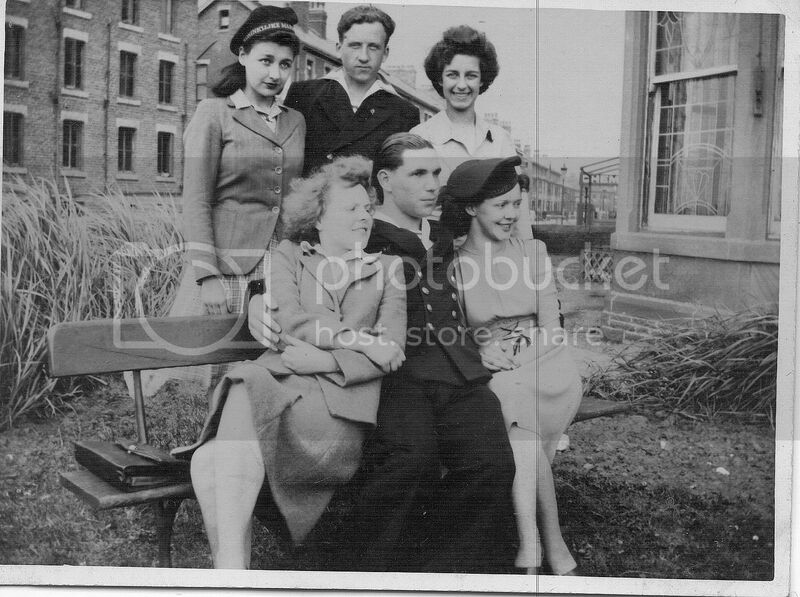 Those girls (in hair and dress) don't look English..I know St Chad's Cllge was taken over as a hospital in the GW but not during WW2. Best advice I can give is to ask Jo Teeuswisse on Facebook if you're on there? Hi, Thanks for your comment. I will see if I can find her on Facebook - I just assumed that picture was taken in the UK. For anyone interested I have typed up my Grandad's personal account of how he escaped Holland. The decision to go to England was based on the fact that the hate against the German occupation of our country was growing. The shops became ever more empty and stories were circulating about people especially young patriotic people, who were picked up by British planes. This in fact, did happen, but only those qualified were considered. Two friends and I were inspired by these stories to take matters into our own hands and make escape plans. In brief, this would be a journey to Spain where, we had heard from a reliable source, that the Dutch consul could arrange passage from Spain to England. We decided to leave on December 11, 1941. Three weeks prior to this date we started collecting different requisites such as a compass, binoculars, maps, provisions and money for the journey. We left a letter, outlining our plans, in a book which the father of one of us was reading at the time, together with the request to inform the other parents. We left Delft by train at 13:00 hours with our bikes, for a one way trip to Breda. From Breda we went to the border on a narrow road, where we met many people who were going to Holland to try and buy butter, wheat and potatoes. We soon discovered the possibility of exchanging Dutch Guilders for Belgian Francs, and passed the border without any problems. We spent the first night in the open air near Antwerp in drizzling rain. Because of a Bombardment of Antwerp harbour we hardly slept. The next day we cycled on, via Brussel, to a small village where we found shelter on a farm names ‘De zeven Fonteinen’. There I sold the lamp of my bike to a son of the farmer. The next morning, after a good breakfastand supplied with provisions, we went on to the French border. After showing our identity cards, and under the pretext that we were going to work in the North of France, we passed the border. In a small village not far from Soisson, we sold our bikes through mediation by a Dutchman, a certain Mr Maas. Mr Maas with the cooperation of the French underground armed forces, then smuggled us across the first of two demarcation lines. We subsequently travelled to Paris by train where we exchanged all of our Belgian money for French Francs. We became overly confident as everything was going so smoothly. We even went sightseeing and climbed the Eifel Tower. After that we boarded the train again and travelled to Romorantin which was near the second demarcation line. We arrived in a village, which if my memory serves me right, was called Villefrance. We knew that the demarcation line ran along a riverbank, but because it was winter we were frightened by the width of the river and its fast flowing current. With our binoculars, we could see a bridge, both to our left and to our right at a distance of about five kilometres. We assumed correctly however, that bridges were guarded. We decided to try to cross the river without getting wet. The riverbank was thinly scattered with trees and we decided to make a kind of raft out of branches, which we bound together with pieces of rope and our shoe laces. The unsteady craft was put to water and I was nominated, for no special reason, to be the first to cross to the other side, remaining dry for the greater part. During all this activity we had become less alert and when I looked up I saw a German patrol at very close range. That would be the last time I saw my friends because they were arrested by the Germans. I was ordered to return. Because in fright, I had let the raft float away, I was not able to comply with the command. I promised however, that I would walk in the direction of the bridge and then surrender. As I had promised my friends that we would stay toegtherunder all circumstances, I intended to join them in this manner. So I began to walk along with them, but the course of the river forced me to veer more and more to the left and at a given moment I has lost eye contact with the group. I quickly got the idea that I was on a little island in the middle of the river. This turned out to be so, as after about ten minutes I was back in the same place. I saw no more Germans, and my two friends were nowhere to be seen either. However, I still wanted to keep my promise. The distance between the island and the other bank was less than the section I had crossed with the raft and I began to look for a tree with an overhanging branch. I hoped, in this way, to cover three quarters of the distance with a Tarzan like swing. I found the tree but the branch broke off as soon as I hung on it and I swam to the other side with great effort. Soaking wet, cold and indifferent, I set off for the bridge. But my path was blocked by a French Gendarme, who asked me where I was going. ‘To the bridge, to my friends’, I replied in my best French. He answered ‘Non, pas bon, les boches; you’re wet, come with me’, and he brought me, after a telephone conversation, to the house of a baker, where my clothes were dried in front of the oven. That night I slept in a cell at a local police station and the following day I was transported to Chateauroux. After another night in a cell and having been interrogated, I was set to work in the barracks, performing domestic chores. I stayed there for about two weeks and celebrated Christmas 1941 with coffee and cognac and, for the first time in ages, with a full stomach. Shortly after new year I was transported to the barracks of the Foreign Legion in Marseilles. On January 5th 1942, I signed up for five year’s service, was dressed in the uniform of the Foreign Legion and given basic traning. In February 1942, I was transported , via the Mediteranean Sea, Oran and Algiers, to Sidi-Bel-a Bes in Algeria. Severe military training began in early March 1942 and after three months I received extra training for the 81mm mortar and the heavy machine gun for two months in Ein-el-Hadjar. After this training, which lasted five months in all, I had to accompany two soldiers to the penal colony at Colom-Beschar. Next, I went back to Sidi-Bel-a Bes and I was in the awkward position of perhaps being made to fight against the Americans, who had landed near Oran in November 1942. This lasted for five days without, however, any actual combat action. We subsequently returned to Sidi-Bel-a Bes in order to prepare ourselves for action against the Germans and Italians in Tunisia. I was part of the entire action, which lasted until the surrender of the enemy forces and merging with the 8th British Army. During the fighting in Tunisia, I wrote a letter to the Dutch Consul in London. This letter was smuggled to the U.K by a wounded British soldier. Next we headed back to Sidi-Bel-a Bes were we were transported to Morocco. During this journey I caught jaundice and was admitted to the hospital in Cassablanca. After having recovered we set off for Marakesh in Morocco, where I was incorporated into the ‘Regiment du Marche’, our destination being the Italian coast, later to become the Anzio beach head. During the preparations for departure, it appeared that my latest letter had been successful. I was called to report to the Regiment Office and could leave for Sidi-Bel-a Bes, where the contract, after twenty months of service was annulled on September 13th 1943. I subsequently left for the Dutch Embassy in Algiers and from there for Maison Carree, a transit camp. About five weeks later, I left for Liverpool, where I arrived on November 11th 1943. From there to Wolverhampton, where I was provisionally incorporated into the ‘Prinses Irene Brigade’. After about three weeks, I left for London and reported to the headquarters of the Royal Marines, near Marble Arch. I was station with the Motor Torpedo Boats in Dover. From January 1944 until D-day (June 6th 1944) I served with this section on the MTB-229. This boat was hit just above the water line, after which I was immediately transferred to the Mine Sweeper Corps in Harwich. Here I served on ML 164, first in Hrwich and later in Ijumuiden, until my demobilisation in March 1946. I was personally presented with the ‘Kruis van Verdienste’ (Cross of Merit) on February 10th 1944, by HM Queen Wilhelmina in London. I received the ‘Nederlands Oorlogsherinneringskruis met gespen’ (Dutch Commemorative War Cross with clasps) in March 1946 in Ijmuiden and the Bronze ‘Engelandvaarders’ medal in April 1946 in the Hague. General Boisseau, Commander of the ‘Marche d’Oran’ division, declares by order of the day of June 8th 1943, that the legionnaire Jan Overvoorde displayed great courage on February 5th 1943, during the battle at Djebel Mansour, and under fierce enemy artillery fire, volunteered to search for wounded soldiers between the lines. Despite the enemy fire, he personally brought back a wounded British Officer. In addition on 25th April 1943 during the battle at Sidi-Abt-El-Kreny and on May 4th 1943, in the Region de Depiennes, he displayed great courage under enemy fire. Jan Overvoorde was decorated in London on February 10th 1944, with the CROSS OF MERIT, because of his carefully planned and executed escape from the Netherlands under German occupation, eventually resulting, after a painstaking journey, in his arrival in the United Kingdom. Interesting account of granddad ! I will see if I can find some more info of him. There's a mentioning of a J.O. or J.D. Overvoorde in the book "Tulpen voor Wilhelmina" (Tulips for (queen) Wilhelmina) an account of the Dutch Engelandvaarders in WW2. I don't have this book but there's a PDF-file, in Dutch, on the internet. Fascinating bit of history, he was certainly a chap who's been around a bit, no doubt had some great stories to tell !